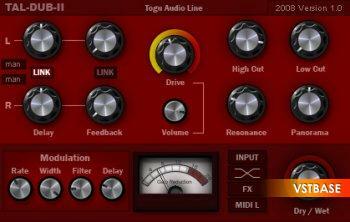 TAL-DUB-II is an extended version of TAL-Dub-I with a completely new sound engine. A 4x oversampled distortion stage allows to add vintage distortion to the delayd signal, but its also possible to make clean delays. A sinus LFO has the possibility to modulate delay time and low pass filter cutoff. Adjustable LFO stereo width is also included. An analog sounding 6dB low pass filter with resonance and a 3dB high cut filter are also parts of TAL-DUB-II. Different routing options open a wide range of possibilities. Synced delay times (1/16, 1/8, 1/4, 1/2, 1/1, 2/1 and trippled and dotted notes). LFO (low pass cutoff and delay modulation, stereo width). 6dB resonance low pass filter. Special thanks to Flemming Bloch from Mindless Studio for testing and user interface optimation.